Hosted by First Minister The Rt. Hon. Mark Drakeford AM and the Leader of Cardiff Council Councillor Huw Thomas, the event was led by the Reverend Canon Stewart Lisk. The statement of commitment was read by The Rt. Hon. The Lord Mayor of Cardiff, Councillor Dianne Rees. Renate Collins, who was on the last Kindertransport train out of Prague arranged by Sir Nicholas Winton, spoke about her experience, and two school pupils from Ysgol Gyfun Rhydywaun reflected on their visit to Auschwitz-Birkenau. Reflections were read by Aliya Mohammed, Chief Executive Officer of Race Equality First, Tom Hendry from The Association of Gypsies and Travellers in Wales, Marie Brousseau-Navarro, President of the Consular Association in Wales, Dr Mazim Alfaham, representing Noah’s Ark Children’s Hospital Charity, Maurice Simove, Chair of the Association of Jewish Ex-Servicemen and Women, Peredur Owen Griffiths, Director of Displaced People in Action, and Connor Clarke, Member of UK Youth Parliament. The traditional Hebrew Prayer, Ell Male Rachamim, was read in Hebrew by Rebbetzin Aidele Rose. Mike and Colette Hughes, the founder members of the Rwanda/UK Goodwill Organisation, provided a keynote speech on Remembering Rwanda, to mark the 25th anniversary of the genocide in Rwanda. 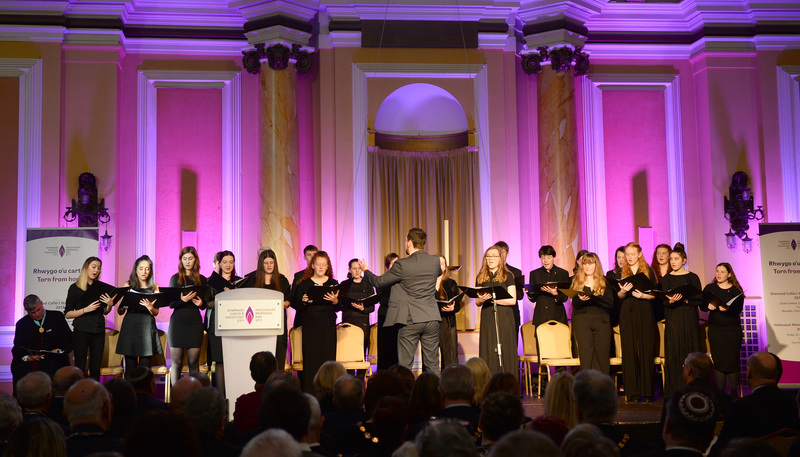 Music was performed by members of the Cardiff County and Vale of Glamorgan Youth Choir, and the ceremony ended with the laying of a wreath by The Rt. Hon. 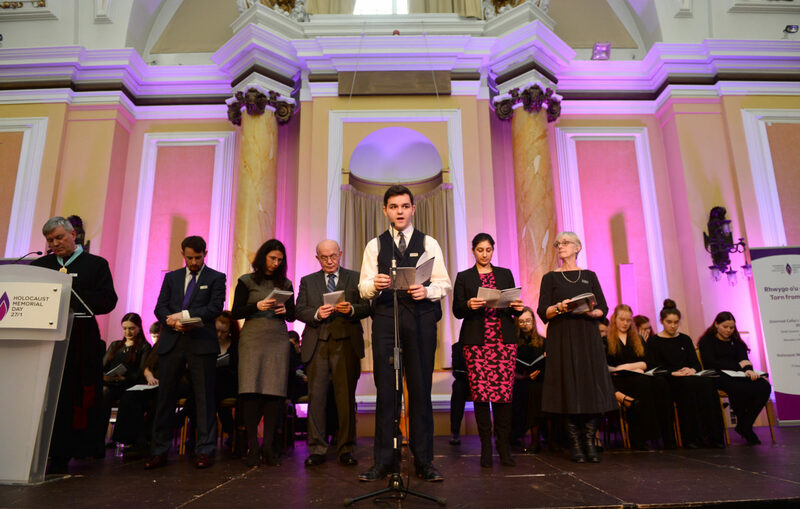 Mark Drakeford AM, Councillor Huw Thomas, Mr Saleem Kidwai OBE from Interfaith Council of Wales , Paul Collins, the son of a Holocaust survivor, and HMDT Vice-Chairperson, Sir Leigh Lewis. 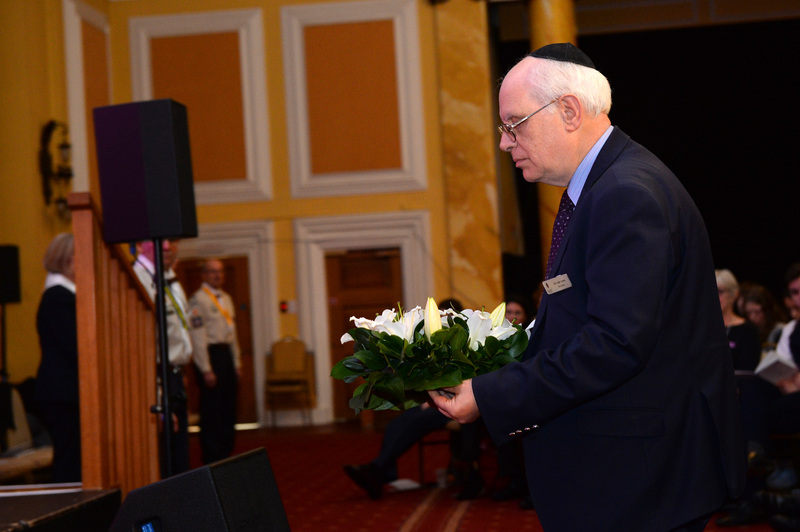 The ceremony ended with a pledge written by the national poet of Wales, Gwyneth Lewis, and blessing given by The Reverend Canon Stewart Lisk, John Minkes of the South Wales Jewish Representative Council and the Most Reverend John Davies, Archbishop of Wales. 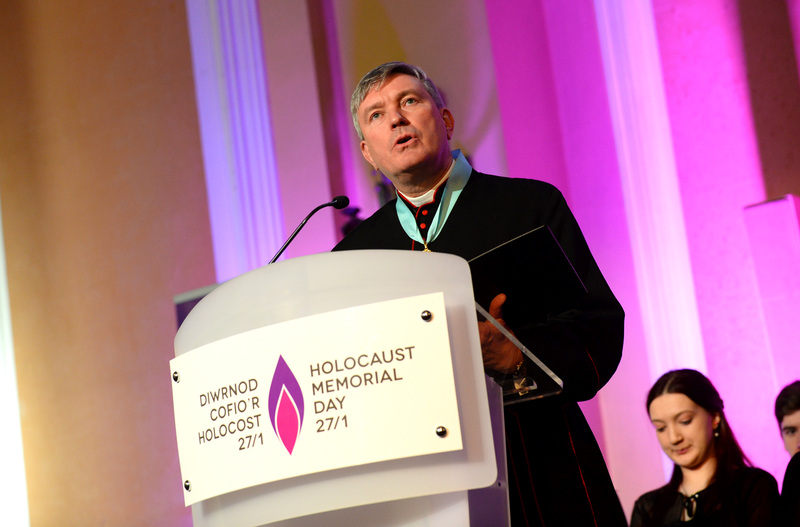 View a selection of images from the HMD 2019 Commemorative Ceremony in Wales.